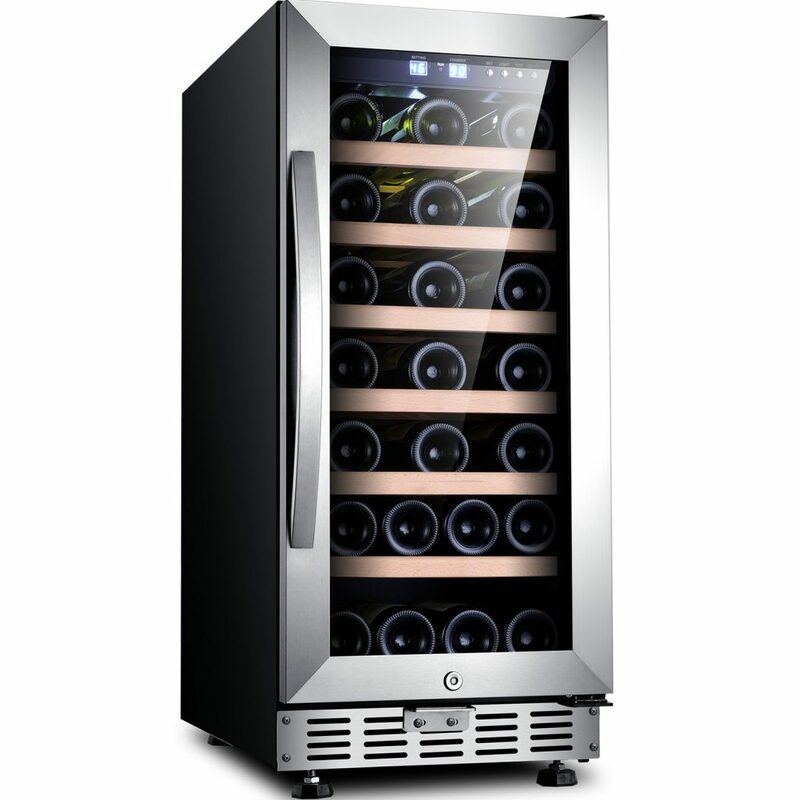 This article covers the best built-in wine coolers on the market today. 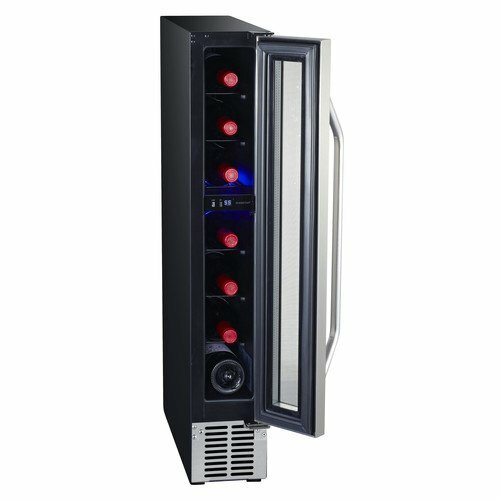 If you are looking for a free-standing wine cooler please check out our article The Best Freestanding Wine coolers. Unsurprisingly, built-in wine coolers come in default width settings to fit your kitchen. Most are 15” wide but you can get double widths and also half widths to match your space. Let’s start with a narrow-fitting wine cooler. We love the EdgeStar built-in wine cooler with its great looks and impressive use of internal space that will transform a tight spot in your kitchen. At only 6” width this wine cooler surprises with its capacity to hold seven bottles of your favorite wine. Designed to accommodate standard 2.75” width Bordeaux-style bottles it can nevertheless hold slightly bigger bottles by removing shelves. It’s a modern, clean-looking appliance that will add a touch of style to your décor. This is an energy efficient compressor model and has an easy-to-use temperature control with a range of 40 – 65°F which is ideal for whites or reds. The quiet internal fan runs with hardly any vibration and does a good job of keeping the cabinet at a uniform temperature and humidity. Its exact dimensions are 34.38″ x 5.88″ x 18.63″ (H x W x D). The door handle can be mounted for left or right opening, a nice touch that we appreciate. The cabinet interior is lit by soft blue LEDs and looks amazing without being over the top. Capacity based on standard Bordeaux style wine bottles with a diameter of 2.75". You can accommodate larger bottles by removing a shelf, keep in mind this will decrease the stated bottle capacity. Looking fabulous in black, the Koldfront cooler has a minimalist style that really works for it. These design cues carry through to the recessed handle so its front panel remains unobscured. Thought has been put into every aspect of this design, the reverse racking allows for more bottles to be stored per shelf than on regular designs. A full five Bordeaux-size bottles sit comfortably on each of the slide-out wire rack shelves. Left or right-handed? Then simply reverse the door. The cabinet uses a fan to maintain a constant temperature without warmer or colder regions. It also possesses an auto-defrost function. The temperature is a breeze to set using the soft-touch control panel and the current temperature display is very easy to read. The Koldfront can be set between 40 – 65°F so it can be used for whites or reds. The bottles inside are illuminated by an attractive, soft blue LED light. As compressor-based models go the Koldfront does an impressive job of keeping the inherent sound and vibrations to a minimum thanks to rubber bushings. Once housed inside a kitchen unit it’s comparative in volume to a modern fridge. At a slightly higher price point the Sinoartizan wows us with the extra features you get for your money. Mechanically the great quality compressor runs with hardly any vibration, assuring that naturally occurring wine sediments aren’t disturbed so the taste is unaffected. It’s also surprisingly quiet even when it cycles. The internal fan maintains a uniform cabinet temperature and prevents frosting. The interior is lit by multiple low emission white LEDs which illuminate the fridge’s bounty without causing any damage. Be aware that harsher lighting from cheaper units (none on our list!) will affect the taste of your wine. A double pane, tempered glass door helps reduce the amount of UV light penetrating inside, improves insulation and is also a safety feature. When it comes to temperature control, the display is clear and the functions are of the push-button type. The Sinoartizan’s temperature range is a wide 41 – 72°F which is suitable for any wine or champagne. 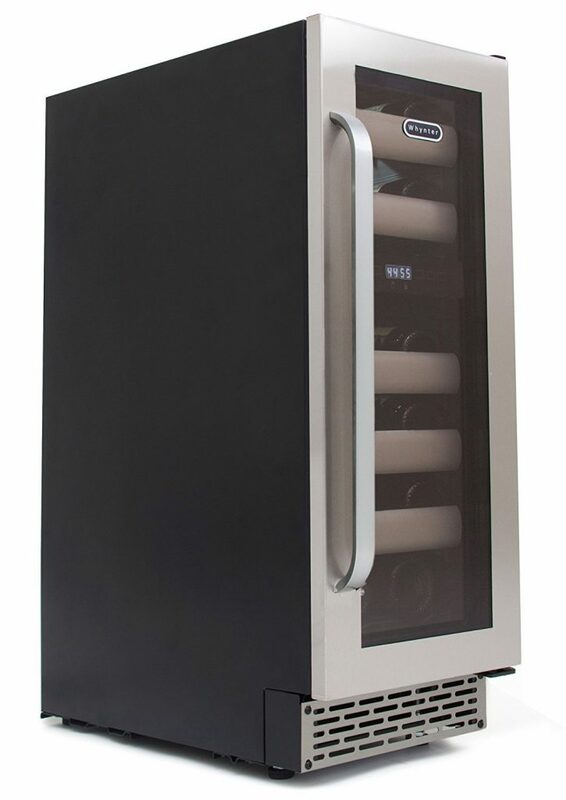 The cabinet boasts a solid polyurethane foam lining for efficient temperature stability and a carbon filter to maintain an odor-free atmosphere that helps extend the lifetime of your wines. We love the wood shelving which adds an extra level of style to proceedings. Even the control fascia looks good with its metal buttons. The appliance is finished in crisp black and can be used as a free-standing unit if preferred. 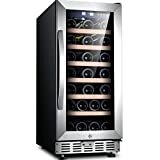 The wine cooler’s dimensions are 15″ x 23.6″ x 34.4″ (W x D x H). The shelves are designed to hold four Bordeaux bottles per shelf but also have enough vertical space to accommodate three outsize bottles. We also appreciate the inclusion of a discreet locking mechanism to keep prying hands out and keep your youngsters safe. ENERGY EFFICIENT QUIET COMPRESSOR COOLING SYSTEM: Uses ozone friendly R-600A Refrigerant, cools more efficiently to maintain a consistent temperature environment for both long-term(storage/aging) and short-term(drinking) needs, reduce consumption by 25% to protect our environment. Also runs virtually silent with low vibration, so wine sediments are not disturbed and flavor is crisp and delicious. OPTIMUM HUMIDITY STORAGE: Insulated with Solid polyurethane heavy foam and carbon filter inside to ensure an interior odor-free environment that maintains constant humidity, keeping the cork from drying out, thus preventing more air to come into contact with the wine. 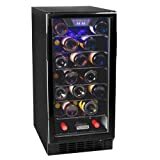 STABLE TEMPERATURE CONTROL:This wine cooler can comfortably store up to 33 of your favorite bottles in a consistent stable temp environment since it is equipped with the smart temperature detector. Allows you to create an ideal climate for your wines ageing process (Range 41-72°F (5º - 22ºC), bringing out the true characteristics and full flavor of your wines in the long-term. Quickly monitor and set temperatures with easy push button controls. LIGHT UP ANY ROOM DÉCOR: Covered with a fully-finished black cabinet, a stainless steel framed glass door, a curved handle and the front-venting, which can be built in to your cabinetry for a seamless look or allowing you to use it as a freestanding unit that will look great in any room of your home or office. Also equipped with the soft white LED lighting to illuminate the interior and display your prized bottles. BONUS FEATURES AND ONE YEAR WARRANTY: Double layered tempered glass with UV shield • removable wooden shelves to allow you to customize the storage capabilities • built-in security lock protects your collection •ONE YEAR WARRANTY GUARANTTED• we stand behind our products and pride ourselves with exceptional customer service care. All of our items offer 1 year warranty. If you need more help please contact us at sinoartizan01@126.com. The Whynter built-in wine cooler is our first dual zone model on test. It’s a fantastic looking fridge with a seamless stainless steel door. Speaking of doors, this has a double-pane smoked, tempered glass door that helps keep the heat out and the cold in. The brushed stainless steel curved handle is functional and striking. The shelves too are a distinctive style that looks different to anything on the market in part due to their stainless steel facings. There are five shelves in total and each is fully removable. 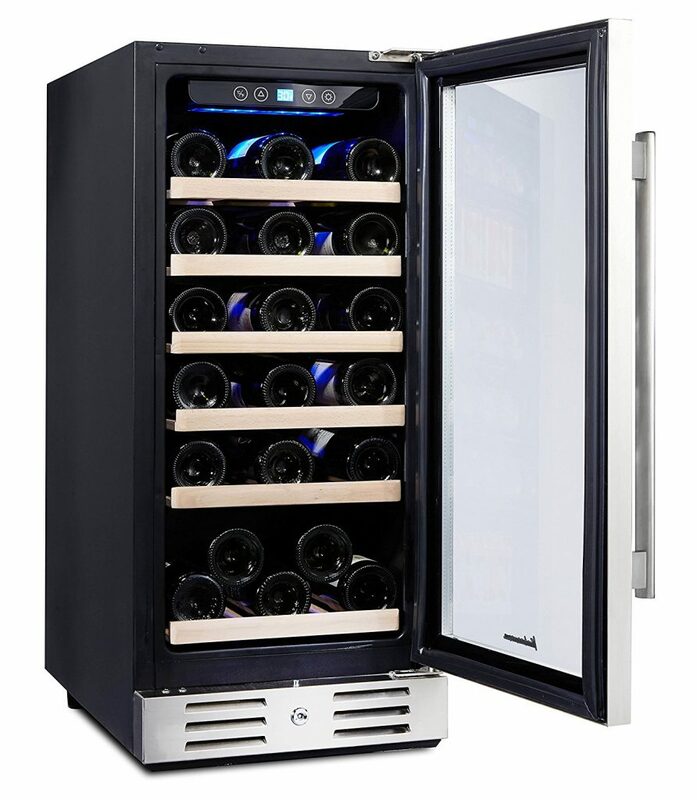 They hold a maximum of 17 regular wine bottles, which may seem small compared to similar size fridges but that’s the compromise for having two cooling zones. The upper zone takes six bottles and the lower zone takes 11 bottles. The temperature range is 41 – 50°F in the upper zone and 50 – 72°F in the lower zone so you can store both whites and reds with confidence. 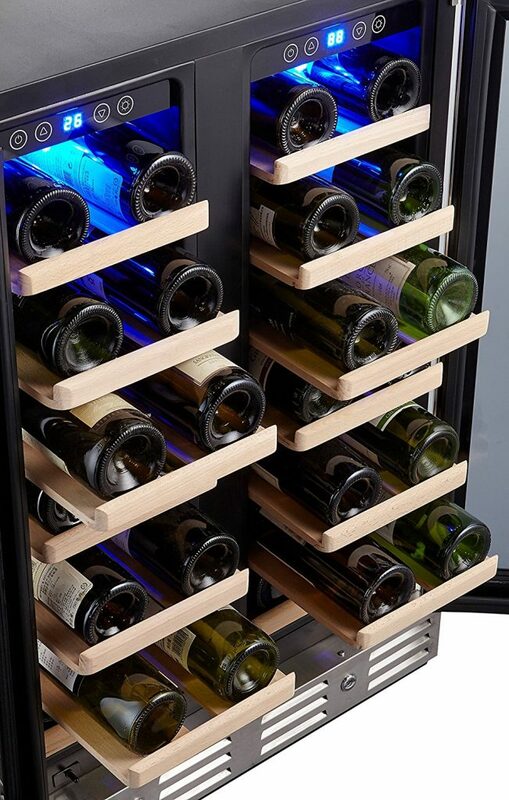 This wine cooler is well-finished and suitable to be used as a free-standing appliance too. It measures 12″ x 23″ x 34.5″ (W x D x H) and fills a gap (no pun intended!) for anyone whose available space is in between common widths. The air inside is fan circulated and we find it maintains a uniform temperature and also keeps the humidity stable. The Whynter is frost free which is a really useful feature. This model opts for soft white LED lighting with settings for display or for regular energy efficient daily use. Innovative use of reverse racking and beautiful beech wood shelves and you have a wine cooler that stores a large number of bottles in an attractive, compact package. Beech wood shelves reduce the risk of damage to your labels. The Kalamera’s racks allow for easy flow which makes for a stable and uniform temperature environment. The racks are removable but they also have stoppers that prevent it from sliding straight out depositing your fragile bottles all over the floor. The presence of a carbon filter ensures that no unpleasant odors build up inside the cabinet. The temperature controls and display are located behind the double-paned glass door preserving the clean exterior and, let’s be honest, they are something you set and don’t change that often. We’ve gone back to soft blue LED lighting to highlight your selection of wine bottles. It’s very much a personal choice but we do like a blue glow on ours although the white LED does show off the labels with more accurate colors. 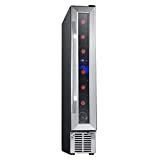 This single zone wine cooler has an operating range of 40 – 66°F and we found it can drop to the lower end and hold it steady within around 30 minutes. A major selling point of the Kalamera is that it has a temperature memory function. Should you be on the receiving end of a power cut this appliance will remember your temperature setting and restore it once the power’s back on. The Kalamera has a fresh, modern stainless steel exterior and, although it’s intended to be a built-in unit, it can be used as a freestanding wine fridge. Its dimensions are 14.9” x 22.4” x 33.9” (W x D x H). The package is completed by a very useful locking mechanism. We wish locks were fitted as standard to all wine coolers. SINGLE ZONE/ONE-TOUCH CONTROL: LED control display makes it easy to set temperature from 40-66°F, providing perfect chilling temperature at all times! 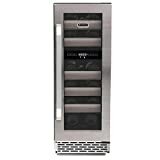 Bringing our review to a close is this impressive 40-bottle capacity dual zone wine cooler again from Kalamera. Essentially it’s a double Kalamera unit with a few tweaks applied for good measure. It features 14 beech wood racks that are less likely to damage your labels than the regular metal type. As with the previous model on test, the racks slide out but have stoppers to prevent them accidently coming out completely. These racks are designed to comfortably take 28 bottles but with reverse racking it will hold 40. The double-paned tempered glass doors help keep the temperature constant and they don’t fog up like cheaper ones do. The outer pane has a reflective coat to further minimize UV light getting inside the cooler and damaging your wine. When the fridge is running the compressor makes very little noise and even when it cycle the volume isn’t distracting. This model has reversible doors which are fairly easy to swap over should you wish to. The internal temperature can be set in the range 40 – 66°F and it has forced fan circulation to keep this uniform throughout. It has the temperature setting memory function that will restore the your programmed temperature in the event of a power cut. When it’s built in to your kitchen layout it makes for a gorgeous focal point which you can have internally lit with a subtle blue glow. You can turn the light off too, the choice is yours. As with the previous Kalamera appliance you can choose to use this as a freestanding cooler, its outer shell is finished in smooth matte black. This fridge comes with two universal hexagon bolt locks for security. At nearly 105 lbs you will probably need a hand moving it into position. It’s a sizable piece of kit measuring 23.4” x 22.4” x 33” (W x D x H). The handle makes it two inches deeper. In this article we’ve illustrated just a few of our top-rated built-in wine coolers. 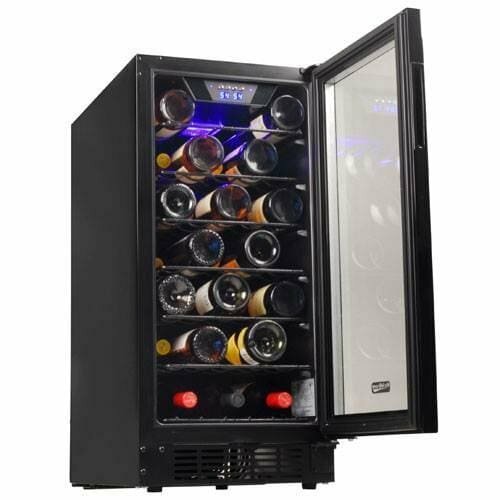 Some are suitable for free-standing use too but if you want to see more specific reviews for these then check out our sister article, The Best Freestanding Wine Coolers. We will be updating both articles throughout the year and keeping you up-to-date with the latest models and hopefully recommending some older favorites too.